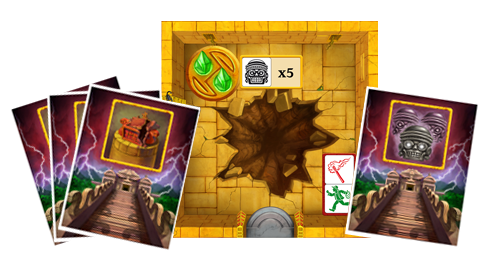 A fast-paced real-time, cooperative dice-driven game of escaping from the cursed Mayan Temple! 780 backers pledged $58,841 to help bring this project to life. Escape: The Curse of the Mayan Temple is a brand new real-time cooperative dice game, where players are adventurers working together to escape from a Mayan Temple, avoiding pitfalls and completing challenges in order to make their escape before the temple implodes! Escaping the temple with ease? No problem! The game includes several expansion modules to up the ante, presenting new challenges to the players. The temple can be a very cruel place indeed! Real-time game play means never waiting for your turn! All players are rolling simultaneously, frantically rolling their dice throughout the entire game! The real-time game play is enhanced by a soundtrack that accompanies game play, alerting players of events in the game as well as serving as the game timer. The soundtrack lasts exactly 10 minutes, at which point the temple goes boom! If you haven't made it out by the end of the sound track, it's all over for you! All players are working together to escape the temple, so you will all either win or lose as a team. Players will have to rescue each other from curses and cooperate to efficiently complete challenges, all while frantically rolling dice while your heart gets pumping from the ever-suspenseful soundtrack. It's definitely a challenge, as you will constantly be balancing your own needs vs. those of the team. Try to go the adventure alone, however, and chances are the temple will become your tomb! Each player will have a set of custom dice they will need to roll, roll again, and then roll some more throughout the game. In fact, any time spent not rolling the dice is precious time wasted! Need to run to an adjacent room? You'll need to roll some feet! Need to complete a challenge? You might need to roll some torches! But watch out, the dice also may come up cursed, in which case you'll need to roll a charm to cure the curses. Roll too many curses at a time, and you might be begging and screaming for the aid of one of your co-adventurers! If you order the game here on Kickstarter, you'll get the game a full two weeks before the street date! No funny business; you will be the very first people to own the game. Guaranteed. Wave it around in front of your friends! Flaunt it on BoardGameGeek! Make yourself the envy of your game group! If you choose any of the COLLECTOR'S supporter levels, you will receive a numbered special collector's edition of Escape, signed by the designer and featuring gold foiling on the box. Bling! If you pledge at any of the +MORE levels, you'll movie-style poster featuring some sweet artwork from Escape to make your game room a stylin' place! If you pledge at any of the +MORE levels, you'll receive a bonus promo that won't ship with any other copies of the game. The promo will not be Kickstarter exclusive, but late adopters will have to pay a little extra, while you get it early and for FREE! The bonus promos will consist of two new types of curse tiles (3x "Lost Treasure" & 1x "Really Cursed") and one bonus room, "The Pit". When playing with curse tiles, the new curses add variety to the curses that might arise. "Lost Treasure" will do exactly what it sounds like it would do: you lose a treasure (if you are playing with treasures). If you don't have a treasure, lucky you! "Really Cursed" will force you to draw two curses for the remainder of the game whenever you get cursed! "The Pit" adds a new potential room to the game. A player may activate two gems in the pit, but only by rolling 5 curses! This means he will definitely need assistance from another player to get back out of the pit again. Additionally, we have three stretch rewards which will be announced when we hit the required levels. When these funding levels are hit, all backers at any level that contains a copy of Escape will receive the stretch rewards (one set per copy of Escape ordered). We think they're pretty cool, but you'll have to wait and see! So, tell your friends, and let's hit these goals! If you guys go really crazy for Escape and we blow away $60,000, who knows, maybe we'll add another stretch goal later! Funding Bonus: The entire first expansion to Escape! See Update #5! Stretch Goal #1: Explorer stickers and a copy of Roma! See Update #9! Stretch Goal #2: Doomed and Stand-Up Curses! See Update #11! Stretch Goal #3: Two new Rescue tiles! See Update #12! Stretch Goal #4: A pawn and dice set for a 6th player. See Update #13! 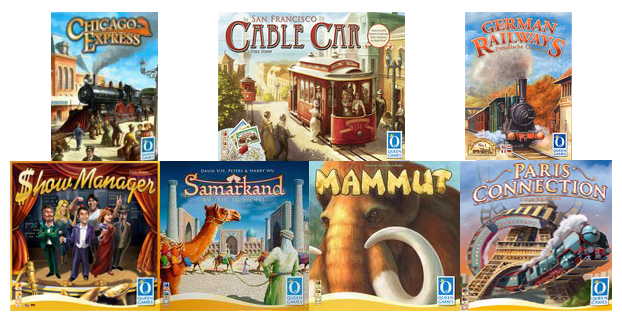 In addition to the ability to preorder a copy of Escape, we're also giving you the ability to choose amongst seven other titles from our line-up at special Kickstarter prices! The first added game is $40, the second is $30, and if you spring for a third additional game, it's yours for only $20! Your choices are shown below. At the end of every Kickstarter project, there is a survey to collect your address and other information. You will get to choose your games in this survey. HAPPY TO SUPPORT. Limited Collector Poster of Escape artwork. Poster will be rolled and shipped in a poster tube. Includes shipping in the continental United States! All other locations please add $5 shipping. ESCAPE ADVENTURE KIT. This level is for a special Escape canvas bag, as well as the 2nd full Escape expansion which will be available in September! The bag will be an Indiana Jones style canvas bag (in the style of the bag depicted on the box) done in very high quality, so it will not be a cheaply produced bag and would retail for $30. It will be able to hold the Escape base game plus all promos and expansions. This supporter level also includes the full 2nd Escape expansion, which is scheduled to release in September. Includes shipping in the continental United States, Germany, and Canada! All other locations please add $15 shipping. CUTTING EDGE + MORE. An advance copy of Escape (will be delivered at least two weeks prior to the street release) including the bonus promo expansion as well as the Limited Collector poster! With this option, the poster will come folded into the box. If you would rather have your poster rolled and shipped in a tube, please include $5 extra. We have found a way to better distribute the game to more countries, so this includes shipping in the continental United States, Canada, and Germany! All other locations please add $15 shipping. COLLECTOR'S CUTTING EDGE + MORE. An advance Collector's Edition copy of Escape (will be delivered at least two weeks prior to the street release) including a bonus promo expansion as well as the Limited Collector poster! Escape Collector's Edition will feature a numbered and designer-signed gold foiled box! With this option, the poster will come folded into the box. If you would rather have your poster rolled and shipped in a tube, please include $5 extra. Includes shipping in the continental United States! All other locations please add $15 shipping. CUTTING EDGE + MORE + ESCAPE ADVENTURE PACK. Includes everything from both the CUTTING EDGE + MORE and ESCAPE ADVENTURE PACK level. You will receive the CUTTING EDGE + MORE shipment in June, and the ADVENTURE PACK materials in September. Includes shipping in the continental United States, Canada, and Germany! All other locations please add $15 shipping. COLLECTOR'S CUTTING EDGE + MORE + ESCAPE ADVENTURE PACK. Includes everything from both the COLLECTOR'S CUTTING EDGE + MORE and ESCAPE ADVENTURE PACK level. You will receive the COLLECTOR'S CUTTING EDGE + MORE shipment in June, and the ADVENTURE PACK materials in September. Includes shipping in the continental United States, Canada, and Germany! All other locations please add $15 shipping. (CUTTING EDGE + MORE) x 2. Two advance copies of Escape (will be delivered at least two weeks prior to the street release) each including the bonus promo expansion as well as the Limited Collector poster! With this option, the poster will come folded into the box. If you would rather have your poster rolled and shipped in a tube, please include $5 extra. We have found a way to better distribute the game to more countries, so this includes shipping in the continental United States, Canada, and Germany! All other locations please add $15 shipping. COLLECTOR'S CUTTING EDGE + MORE + ONE. An advance Collector's Edition copy of Escape (will be delivered at least two weeks prior to the street release) including a bonus promo expansion as well as the Limited Collector poster! Additionally, you receive your choice of ONE bonus Queen Game of your choice from those listed in the description to the left. With this option, the poster will come folded into the box. If you would rather have your poster rolled and shipped in a tube, please include $5 extra. Includes shipping in the continental United States! All other locations please add $15 shipping. COMBO PACK. Everything listed in the CUTTING EDGE and COLLECTOR'S CUTTING EDGE + MORE funding tiers if you would like both the Collector's Edition as well as the regular edition. With this option, the poster will come folded into the box. If you would rather have your poster rolled and shipped in a tube, please include $5 extra. Includes shipping in the continental United States! All other locations please add $15 shipping. (COLLECTOR'S CUTTING EDGE + MORE) x 2. Two advance Collector's Edition copies of Escape (will be delivered at least two weeks prior to the street release) including bonus promo expansions as well as the Limited Collector posters! Escape Collector's Edition will feature a numbered and designer-signed gold foiled box! With this option, the poster will come folded into the box. If you would rather have your poster rolled and shipped in a tube, please include $5 extra. Includes shipping in the continental United States! All other locations please add $15 shipping. COLLECTOR'S CUTTING EDGE + MORE + TWO. An advance Collector's Edition copy of Escape (will be delivered at least two weeks prior to the street release) including a bonus promo expansion as well as the Limited Collector poster! Additionally, you receive your choice of TWO bonus Queen Game of your choice from those listed in the description to the left. With this option, the poster will come folded into the box. If you would rather have your poster rolled and shipped in a tube, please include $5 extra. Includes shipping in the continental United States! All other locations please add $15 shipping. COLLECTOR'S CUTTING EDGE + MORE + THREE. An advance Collector's Edition copy of Escape (will be delivered at least two weeks prior to the street release) including a bonus promo expansion as well as the Limited Collector poster! Additionally, you receive your choice of THREE bonus Queen Game of your choice from those listed in the description to the left. With this option, the poster will come folded into the box. If you would rather have your poster rolled and shipped in a tube, please include $5 extra. Includes shipping in the continental United States! All other locations please add $15 shipping. (COLLECTOR'S CUTTING EDGE + MORE) x 6. Six advance Collector's Edition copies of Escape (will be delivered at least two weeks prior to the street release) including bonus promo expansions as well as the Limited Collector posters! Escape Collector's Edition will feature a numbered and designer-signed gold foiled box! With this option, the poster will come folded into the box. If you would rather have your poster rolled and shipped in a tube, please include $30 extra. Includes shipping in the continental United States! All other locations please add $30 shipping.